Calling Britain's real cooks! What food best matches your mood? 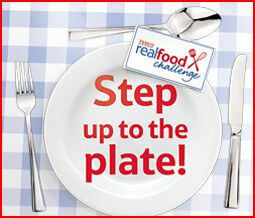 Tesco have launched their Real Food Challenge and are looking for YOUR recipes! By entering a recipe, you could win a prize or even go on to appear in a new TV show. Eight home cooks will be selected to appear on the Real Food Cook Off, which will be presented by rugby legend and food enthusiast Matt Dawson and Celebrity Masterchef-winner Lisa Faulkner. There are eight mealtime mood categories to choose from, and my category - which is headed by the lovely celebrity Suzi Perry (who you may know from The Gadget Show) - is 'Breakfast on the Go'. This means recipes that are fast, simple and portable, especially for eating on-the-go, food we can eat at our desks or even while waiting for a bus! So what are you waiting for? Pop over to the website and meet the Real Food Panel, made up of bloggers and food lovers, and then please POST YOUR RECIPES, especially your Breakfast on the Go recipes!! P.S. I'm hoping to interview Suzi, so if you have any interesting food questions you would like to me to ask her, please tweet them to me using the hashtag #realfood. 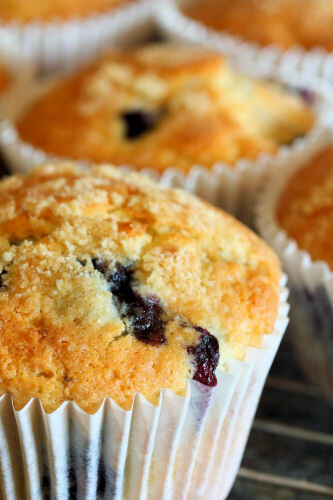 Here is one of my own favourite Breakfast on the Go recipes, Blueberry Muffins. As a mum of two older teens, I always nag try to make sure they eat breakfast before heading out for their day. Sometimes I remind myself that anything is probably better than nothing, but if they don't have time to eat at home, I get them to take something with them. These muffins are full of fresh blueberries and they are flavoured with lemon zest for extra zing. I put an oaty crumble topping on them for a little crunch. Makes approximately 11-12 muffins, depending on the size of your muffin tin. The crumble topping is optional and it makes more than you need, but the extra topping freezes really well, as do the cooked muffins. 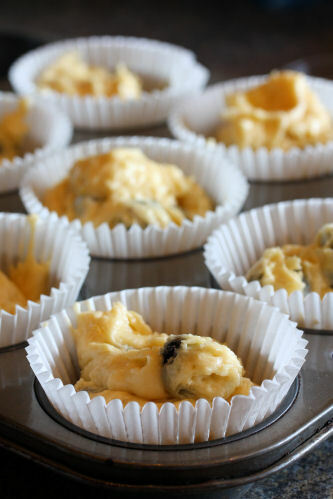 Pre-heat the oven to 180ºC/350ºF and put 12 paper cases into the muffin tin. Make the crumble topping: Put all the ingredients into a food processor and pulse until the butter has dispersed evenly and it looks like large breadcrumbs. Alternatively, you can rub the butter into the flour with your fingertips and then stir in the oats and sugar. For the muffin mixture: In a large bowl, using an electric whisk, beat the butter until creamy. Add the sugar and beat again until pale and fluffy. Add the eggs, one at a time, beating well. Add the lemon zest, lemon extract and the baking powder and beat again. Using a large spoon or spatula, gently fold in half of the flour, followed by half of the milk into the batter. Fold in the rest of the flour and then the remaining milk, followed by the blueberries. Spoon the mixture into the muffin cases, so they are about ¾ full, and top with a teaspoon of the crumble topping. Bake for about 25-30 minutes, until golden brown and firm to the touch. Tip: Take a spoonful of the flour and sprinkle over the blueberries to coat them. This should help to stop them sinking to the bottom of the cupcakes when cooked. This is VERY exciting - just thinking which recipe to submit now! 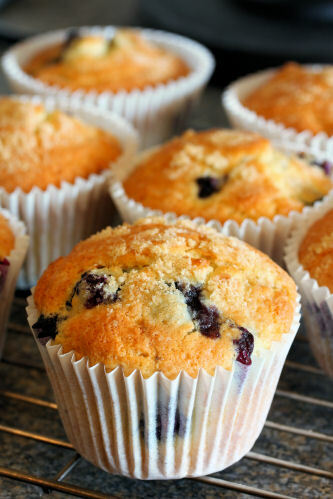 Nic, these muffins look so good and lemon and blueberry are a great pairing! These look fantastic and the oatey topping means you can almost kid yourself you've had fruit and porridge for breakfast. These are by far my all time favourite muffins. I shall watch with interest how the tv show pans out! Can't wait watch later in the year. You're right - that is a gorgeous muffin. Love the addition of lemon. You just can't go wrong with blueberry muffins...I haven't made them from scratch in a long time, but i'm going to have to soon! oh and on the dijon salad that I posted we don't always use eggs. A lot of times we use shrimp, chicken or whatever protein we have on hand...Shrimp was actually my fave!